Down-home attitude and Wild West charms make Arizona Charlie’s Decatur popular with locals and tourists. 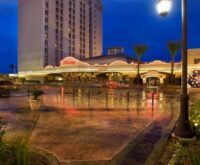 Good food, comfortable rooms, popular lounge acts and a poker room make this hotel an all-around winner. More than just a “neighborhood casino” on Las Vegas’ west side, Arizona Charlie’s Decatur is almost revolutionary in nature. Not only does it boast a huge 24-hour bingo parlor, but it also houses an enclosed non-smoking slot area. Along with a race and sports book and keno lounge, gamblers can try their luck on 12 exciting table games. Of course, there’s much more to Arizona Charlie’s Decatur than its lively casino. Live entertainment in the Naughty Ladies’ Saloon rules almost every night of the week, ranging from popular lounge acts to the occasional national country and classic rock bands. Dining here is also a rich experience, whether you choose the elegant cuisine in Ron’s Steakhouse, the many of options of Charlie’s Market Buffet or just the comfort food of the Sourdough Cafe. Accommodations are comfortable and affordable. Guests can take advantage of a seasonal outdoor swimming pool, arcade and gift shop too. As friendly and willing to please as the cowpoke it was named for, Arizona Charlie’s Decatur is one of Las Vegas’ safe bets.